Attaching top talent to your screenplay doesn’t guarantee that you’ll get your film made, but it certainly increases your chances. The questions asked in 99% of meetings with distributors, film financiers, and sales agents after you’ve pitched your screenplay or they have read your screenplay is: “Who is the director?” followed by “Who is in it? Come to think of it, it’s the SAME question your non-film industry mates ask when you tell them about a film you’ve loved! As soon as film became a business, star attraction became its main currency. Charlie Chaplin, Mary Pickford, and Douglas Fairbanks knew this when they set up United Artists in 1919 to produce and distribute their own films. Upon hearing this, an executive at Metro Pictures who was probably thinking of his shrinking profit margins declared that “the inmates are taking over the asylum”. But don’t forget, it’s not just about raising money for your film, it’s also about selling it. A poster or a DVD cover with known faces will get attention from the public, too. With the exception of horror movies which can sell on the basis of the amount of blood they can shed in 90 minutes, other genres need ‘known faces” to sell. Imagine PHILOMENA without Steve Coogan and Judy Dench. Would it have been that successful with two unknown actors? I doubt it. So … how do you go about attaching top talent to your screenplay? If you’re an experienced and respected producer, you can attach top talent with a pitch or a synopsis. That’s because top actors know your work, trust you to deliver a great screenplay, find a great director, and raise finance for the project. It also helps that a top producer would know the stars personally. Not so easy for a less well-funded producer with few contacts. First and foremost, it’s all down to the screenplay. Considering that top actors receive many scripts or offers a year, your screenplay is the first step to close the deal. After all, Matthew McConaughey agreed to do DALLAS BUYERS CLUB for a fraction of his fee because he was passionate about the screenplay. Same with Jared Leto. When asked about his role, he said: “This was a really special movie. I think it was the role of a lifetime.” With that in mind, it’s of paramount importance that every effort is made to find and develop an exceptional screenplay. It might cost you and it might be a gamble but this is a business. Setting up a film is no different from setting up any other business so you need seed money. Of course, your investment might pay off or it might not. A top casting director might have a connection to the star you’re after. If not, agents listen to a respected casting director who raves about your screenplay. Yes, that old mantra again: without a great screenplay, nothing is going to ever happen. A top casting director is not going to send out an average screenplay. They also have their reputation to protect. 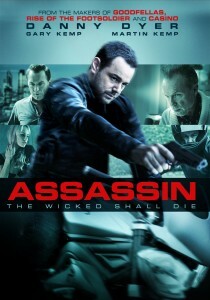 This is exactly how I got Danny Dyer for my film DEVIATION which we then followed up with ASSASSIN. Top Casting director Jeremy Zimmerman was instrumental in getting the screenplay to Danny’s agent and organising my first meeting with Danny. Since then, Danny has gone from the indie film world’s favourite actor to mainstream stardom with Eastenders. I’m very proud of him as I have always said that he’s a very talented actor (and a very nice guy, too.) Needless to say, that his current fame has created great interest in ASSASSIN. Do you know someone who knows the star you’re trying to reach? And I don’t mean the star’s gardener, shrink, pedicurist, or hairdresser. No, it has to be someone who has worked with the said actor: a producer, a director, or another actor are all good bets. A partner, a brother, or a close friend can also work. Bottom line: it has to be someone a star would be likely to listen to. Also, be savvy business-wise: it never hurts to cut a deal with your “contact”, something like “If you get my screenplay to Mr or Miss Star and they like it, I’ll make you a producer on my film.” If that contact helps you attach a star to your screenplay, it’d be money well spent. For ASSASSIN, I knew that one of the original producers had a close relationship with Martin Kemp, so I asked him to get my screenplay to Martin. Martin loved the screenplay and wanted to do our film, so we asked him to get his brother Gary to read the screenplay too. Gary loved it and was in. Of course, it helped that the parts in ASSASSIN were of two brothers. For me, it was a dream come true to reunite the two brothers on screen 20 years after their cult movie, THE KRAYS. What happened was pure networking. I knew a producer who knew the actor I wanted who knew the other actor I wanted. This one is used by a producer I know. Basically, he first casts the smaller parts (the supporting roles, to use Oscar’s lingo) with respected and known actors who are not necessarily stars (think Steven Berkoff or Anna Chancellor, for example). They’re easier to approach and their agents are also easier to get on the phone. Once my producer friend has attached them to his project, he goes after the stars. So he calls or emails their agents, and reels off the names of the supporting actors he has secured. That could be a good punt because the stars you’re after know and respect these actors. That might convince the agent to pass on your screenplay to the star. Or you could convince your supporting actor to talk directly to the star. That last part is more delicate: you don’t want the supporting actor to feel you’re using them just to get the top prize. (Caveat: I’ve never tried that method and tbh I wouldn’t use it, but I like its ingenuity). Of course, you can go also all gung ho to attach a star to your screenplay: stalk a top actor, corner them in a restaurant or party you’ve blagged your way into and shove your screenplay in their hands. Or find out where they live and stuff your screenplay in their letterbox along with a heartfelt letter about how they were born to be in your film. It might work … but chances are you’ll either scare them or piss them off. There are many ways to attach a top talent to your project, some I don’t even know of – yet! – but if you’re unknown, or not so experienced, remember only your screenplay will do the talking for you. BIO: @jkamalou is a writer, producer, director. His film ASSASSIN is out on 9th March 2015, watch the trailer HERE and pre-order by clicking HERE or on the pics above.